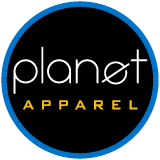 Planet Apparel provides quality screen printed and embroidered apparel, promotional products, and brand name recognition to a variety of clients ranging from corporate, small business, clothing lines, clubs, and schools, to events, military, family reunions and end users. We work with people like yourself, whether you are a new business or frustrated with your last printer’s results. We achieve results with clients who are committed to service, quality and a lasting relationship. Call us now: (858) 569-2090. Consider Planet Apparel for your next custom order. We offer anything from custom T shirts, polo shirts, corporate gifts, T shirt designs, embroidery for polos to corporate identity and branding. If you are looking for executive business gifts, promotional products, advertising specialty, tradeshow giveaways, premiums, or chachkies, you have come to the right place. So whether it’s something corporate or you just need basic T-shirt screen printing, give us a call. We are conveniently located in beautiful central San Diego in the Kearney Mesa area at Balboa and Convoy, just South of Miramar, Mira Mesa and North of Mission Valley and Downtown. Most of our silkscreen, embroidered and promotional product orders are conveniently done over the phone and email. If you are out of town we ship orders daily via Fedex or UPS. Call (858) 569-2090 or contact us today and tell us about your project.